Fender Musical Instruments Corp, whose electric guitars have powered music from Jimi Hendrix to Nirvana, is getting into the software business with an app for guitar lessons. 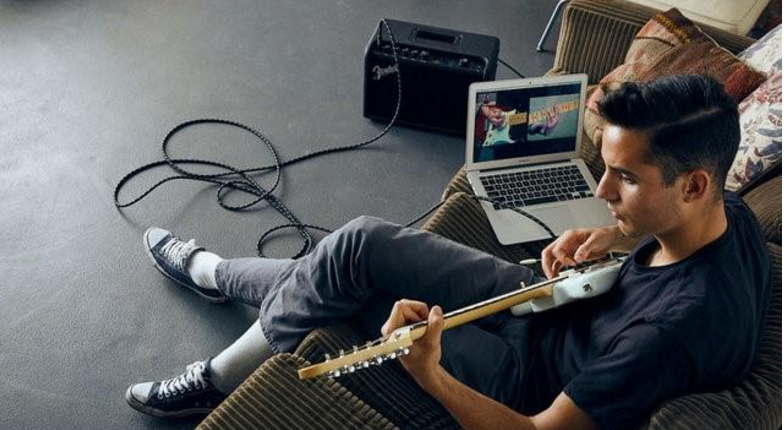 The Scottsdale, Arizona company is launching “Fender Play,” an online system for learning guitar that Chief Executive Officer Andy Mooney, a veteran of Nike and Disney, hopes will cut down on the number of would-be guitarists who give up. He said 45 percent of the company’s guitars sell to first-time players, but 90 percent abandon the instrument within a year and never become repeat customers. The musical instrument industry grew 9 percent to $7.1 billion in retail sales over the past five years but remains well below its 2005 peak of $7.7 billion, according to data from The Music Trades magazine. Moreover, the electric guitar was virtually absent from the Top 20 music charts in the past five years. The guitar industry hoped video games like “Guitar Hero” would ignite interest among teenagers. Instead, electric guitar sales fell from 1.2 million units in 2011 to just over 1 million in 2016, according to The Music Trades. The overall guitar market held steady at around 2.5 million units per year during that period, thanks to growth from acoustic instruments. Fender Play aims to address some key trends, Mooney said. About half of first-time buyers are women, according to Fender’s research, and they are buying acoustic guitars online and going to sites like YouTube for lessons. For those new players, he said, traditional music stores can be intimidating. After a free introduction, Fender Play costs $19.99 a month and consists of a series of video lessons that assume no prior knowledge. Mooney said his model was Lynda.com, the online learning platform acquired by LinkedIn for $1.5 billion that defied expectations it could not compete with free videos on the internet. Next year, Fender will make an instructor edition available to dealers so they can use it to manage their guitar students. Fender will compete with other fee-based sites like JamPlay, but is the first guitar maker to dive into the online learning market. Brian Majeski, the editor of The Music Trades, said including dealers should help Fender avoid the impression that it competes with stores for guitar students. He called the software initiative a credible strategy to try to spur growth.